Russia-backed militants were conducting precision fire from grenade launchers, heavy machine guns and small arms. Positions of Ukraine’s Joint Forces came under hostile fire from 120-mm mortars outside Luhanske, Chermalyk and Lebedynske; Ukrainian troops’ strongholds near Luhanske, Svitlodarsk and Hnutove came under fire from 82-mm mortars. Militants also fired upon the Ukrainian troops defending Vodiane from the weapons mounted on infantry fighting vehicles. In the evening on October 13 Russian proxies mortared residential areas of Chermalyk and Shyrokyne in Mariupol direction with 82-mm and 120-mm mortars. The fire upon the above villages came from the occupied towns of Verkhnioshyrokivske and Sakhanka. 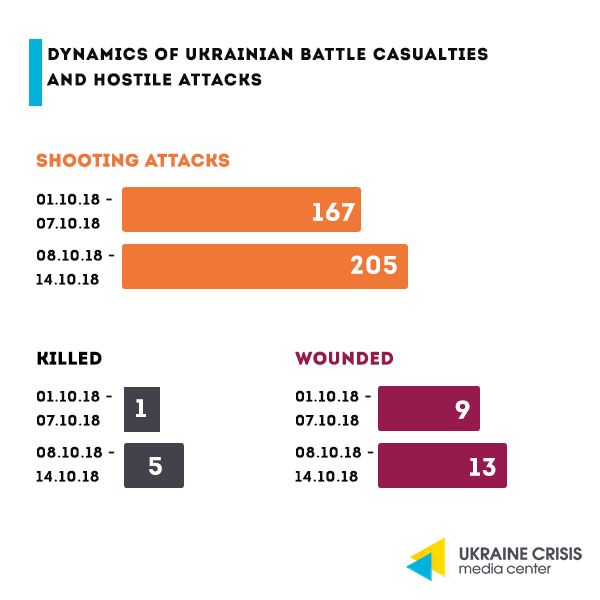 The consequences of the attack are being examined by the Ukrainian side to the Joint Coordination and Control Center and by the OSCE Special Monitoring Mission to Ukraine. 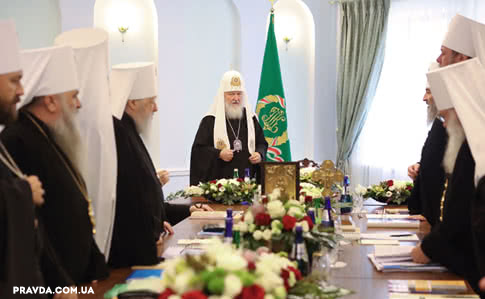 On October 15the Synod (council)of the Russian Orthodox Church in Minsk adopted the decision to break off the relations with the Constantinople Patriarchate. The Synod recognized the impossibility of further Eucharist communication with Constantinople. The decision stipulates that the Russian Orthodox Church will not be implementing Constantinople’s decisions. “The meeting of the Holy Synod adopted the decision to completely break off the communication with the Constantinople Patriarchate,” a representative of the Russian Orthodox Church – Metropolitan Hilarion, commented on the Synod meeting results. Revenging for the support to Ukraine?The decision by the Russian Church is a response to the recent support expressed by Constantinople to the Ukrainian Church when the head of the Ukrainian Orthodox Church of the Kyiv Patriarchate Filaret and the head of the Ukrainian Autocephalous Orthodox Church Makariy were restored in the legitimacy of their positions, the two are Constantinople’s interlocutors on autocephaly to the Ukrainian Church. Also, the act of 1686 subordinating the Kyiv Metropolis to Moscow was revoked and the Stavropegia of the Ecumenical Patriarchate was reestablished in Ukraine. The Russian Orthodox Church sees all the above decisions as illegal and canonically invalid. “The Russian Orthodox Church does not accept these decisions and will not be complying with them. A split remains a split, so do the leaders of the split,” Metropolitan Ilarion emphasized. Practical meaning. From the practical standpoint the decision by the Russian Orthodox Church on breaking off the relations with the Constantinople Patriarchate means that the communion between the priests and the bishops will cease. Parishioners of the Russian Orthodox Church will not be able to commune in the churches of the Constantinople Patriarchate, while Patriarch Kirill will not be mentioning the name of the Constantinople’s Patriarch during the masses. Or just a “crack”? Archimandrite Kyrylo Hovorun who supports autocephaly while belonging to the Moscow Patriarchate is less categorical as to the reality of the new “split”. “Why is it not a split? Firstly, a split requires consent of both sides that they will not be communicating with each other anymore. Constantinople does not seem to be going to break off the relations with Moscow. Secondly, in case the split is global, all other autocephalous churches would need to decide who they are staying with. It is quite unlikely that they would want to do so. The global Orthodoxy will maintain relations with both Moscow and Constantinople (…) The conclusion is: it is not a split but a crack, moreover rather the one imagined by one church because the majority of churches will not be noticing it,” Archimandrite Kyrylo said. “The Russian Orthodox Church will start searching for allies against the Constantinople Patriarchate and will try to split the Orthodoxy internationally. In 2016 Patriarch Kirill managed to convince the Serbian, Bulgarian, Georgian and Antioch Churches not to take part in the All-Orthodox meeting on Crete headed by the Constantinople Patriarch as a result of the conflict between Moscow and Fener (…) But it is quite unlikely that they will break off relations with him, it would be a very dramatic step. After all it is a war of two patriarchs, taking sides is not in their interest. Most probably they will preserve ties with both sides of the argument,” the journalist proceeds. Equal opportunities for military women and men. President of Ukraine Petro Poroshenko signed the Law “On amending some laws of Ukraine to guarantee equal rights and opportunities to women and men during the military service with the Ukrainian Armed Forces or other military units.” “The law gives equal opportunities to both women and men when signing a contract for military service as well as stipulates that women can sign a contract for the maximum duration of the military service,” the statement released on the President’s web site last Friday says. 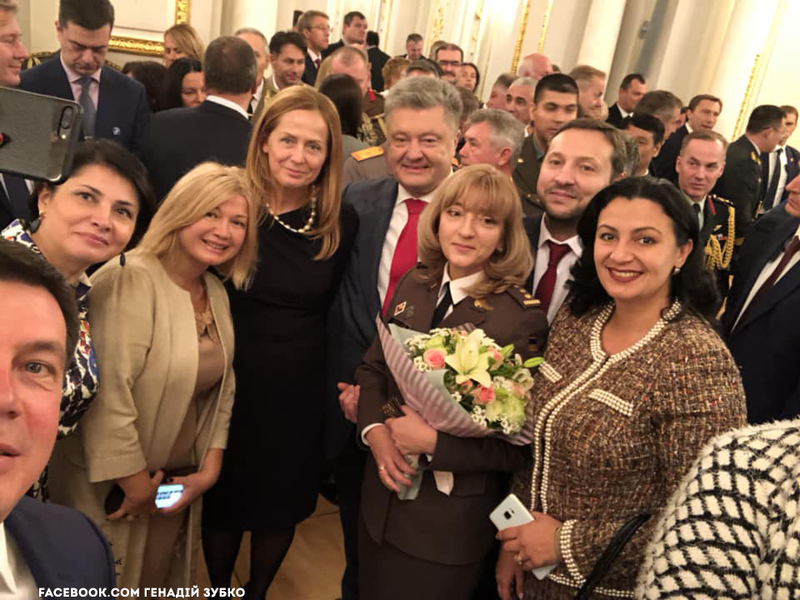 Implementation of the law will help reinforce legal protection of servicewomen, increase their number, in particularly on high-level positions. The first-ever female general. President Poroshenko assigned the Major General rank to a woman for the first time ever. The first Ukrainian female general became Lyudmyla Shuhalei, head of the Military-Medical Directorate at the Security Service of Ukraine. The new old Defense Minister. The President of Ukraine accepted the note of resignation from military service of the Defense Minister of Ukraine Stepan Poltorak who will continue heading the Ministry in the status of a civilian. President Poroshenko noted that according to the Law “On national security” effective January 1, 2019 the Ministry of Defense must be headed by a civilian person. “The law has been agreed with our NATO partners and foresees such procedure. My decision is completely in line with the law,” the President emphasized. According to the new report by the International Monetary Fund (IMF), Ukraine is Europe’s poorest country. The information came from a Facebook post of Volodymyr Kompaniiets, economist and manager of a private investment fund on the US stock market. Ukraine lags behind Moldova in the ranking of countries by GDP per capita. In its October report the IMF increased Ukraine’s GDP per capita against the April data as well as reconsidered the GDP per capita of some other countries. Moldova’s current position in the world ranking is 133rdwith the USD 2.694,469 GDP per capita, while Ukraine is on the 134thplace with the GDP per capita of USD 2.656,01. Ukraine’s average official salary equals to approx. 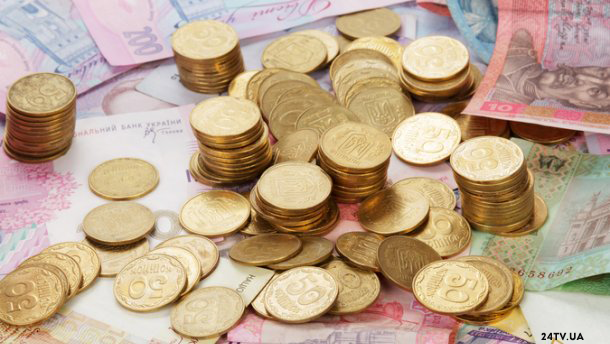 USD 305 (UAH 8.529) in the second quarter of 2018. Ukraine also ranks last in Europe for the official average salary.